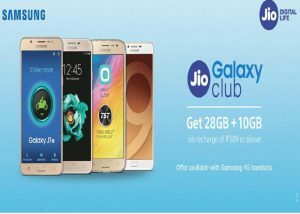 Reliance Jio will offer free data to the owners who buy Samsung Galaxy S8 or S8+ and get 448GB of 4G mobile data on their Reliance Jio network over a period of 8 months for just rupees 309. This translates to 2GB of 4G internet per day called Double Data Offer. 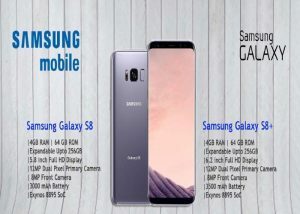 Samsung has just launched the Galaxy S8 and S8+ in India and then Jio will partner with Samsung eligible device Galaxy S8 and S8+ for Double Data benefits offer under Jio Dhan Dhana Dhan plan rupees 309. 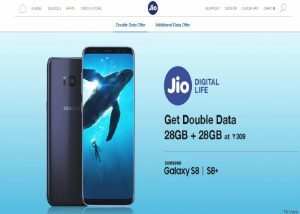 Reliance Jio Double Data benefits eligible device of the S8 comes with a 5.8-inch Quad HD (2960 x 1440 pixels) Infinity display which is curved on both sides while the Galaxy S8+ comes with a 6.2-inch Quad-HD display. Both the handsets boast a strange display aspect ratio of 18:9. The Indian variant of the Galaxy S8 and S8+ is likely to come with Exynos 8895 chipset which is an Octa-Core processor clocked at 2.3 GHz. with get 4GB of RAM and 64GB of internal storage which is expandable up to 256GB via hybrid Dual SIM. Samsung Galaxy S8 packs in a 3000 mAh battery inside while the S8+ comes with 3500mAh battery pack for the stamina. The Galaxy S8 is priced at Rupees 57,900 and the Galaxy S8+ is priced at rupees 64,900. Samsung President and CEO in Southwest Asia said: This time we have made the Galaxy Note 8 bigger and better and added ‘Make for India’ innovations. 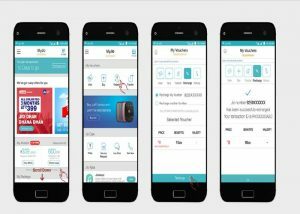 Both the devices has started for sale 5th May on Flipkart and Samsung Shop and the Reliance Jio Double Data offer validity starts from 5th May and will last for 8 months to January 2018. Thereafter the applicable Additional Data Vouchers credited to the account within 48 hours of Recharge.